I’ve encountered a situation where I need to find out the database file,log file, total size and other useful information about a database on SQL Server 2000/2005/2008/R2 versions. The requirement is to use same query and it has to be executed across all version of SQL SERVER. We can also do this using dynamic SQL’s. Here is the T-SQL which you can use to run on any version of SQL Server to fetch the result. This entry was posted in SQL, T-SQL and tagged backupset, DatabasePropertyEx examples, sysaltfiles, sysdatabases. Bookmark the permalink. This is some great information. There were some errors in your script (you can’t just copy and paste it in SSMS to get it to run). I posted about your script on my blog (giving you credit and linking back your blog) and I corrected the script. No problem, they were little changes like sysdatabases should be sys.databases. This is a great script thanks for coming up with it. I’m glad to put it in my toolbox. 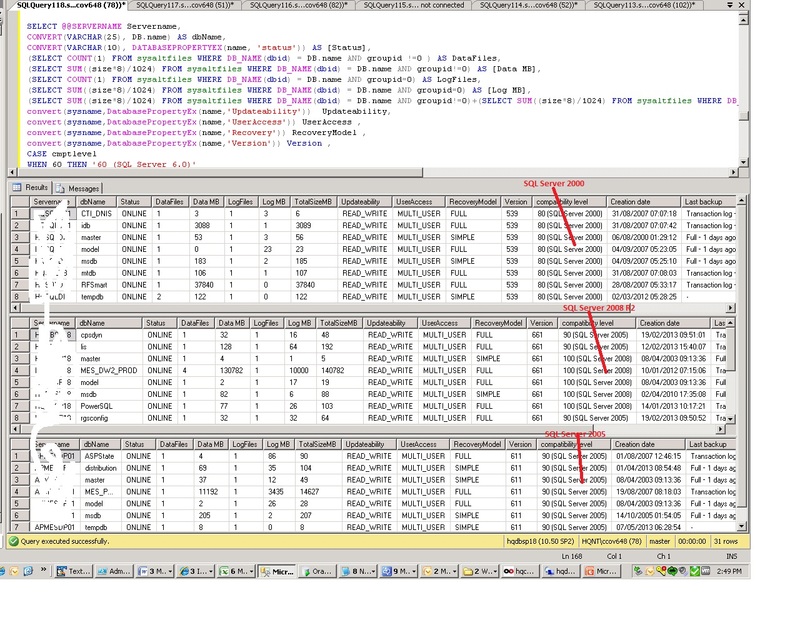 This T-SQL need to be run under master database. The intention is to run the queries on all version of SQL Server from 2000 onward. I just updated the SQL to use Master database. You have a great collection of good articles, Keep it up. Thanks again. Very nice script, thanks !! Hi Prahsanth, Do you have powershell script for this.? You can call the query in PowerShell using Invoke-SqlCmd.